Porsche need no introduction and if they do I suggest you may have been sleeping under a rock for the last forty years!! Since the early fifties they have been one of the mainstays of club racing and have had their share of success on the international circus too. Porsche set out to be a force in motor sport but it wasn’t until the early seventies that they made the rest of the racing community sit up and take notice. The 997 is no exception and the car carries all the lessons learned in International motorsport, in a tight little bundle which is the envy of most other motor manufacturers. 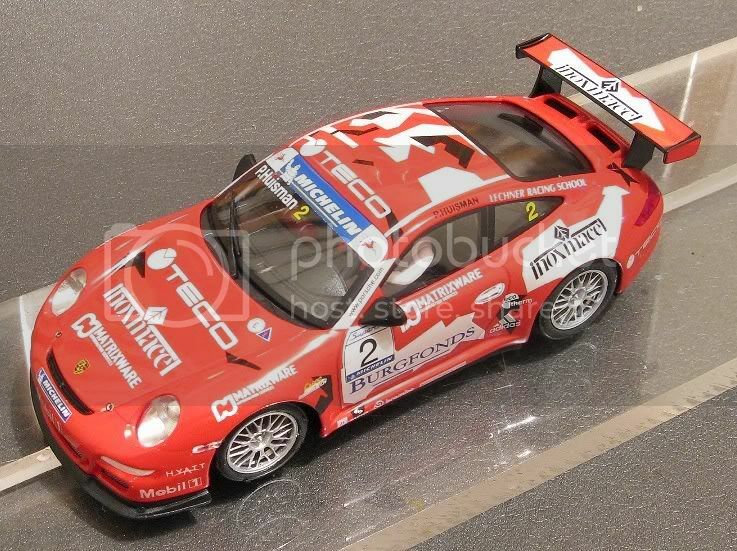 The Ninco Porsche 997 has been out for a little while now but it will surely be released in new liveries for months to come yet. 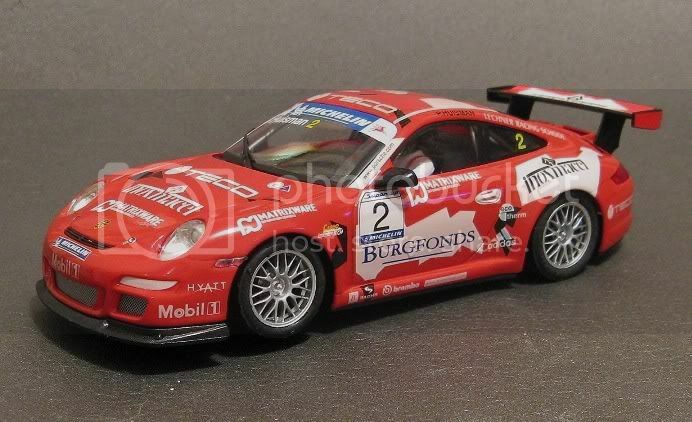 With many clubs holding Porsche Super cup series races it goes without saying that a lot of Ninco models will contend this event. Especially if they are non magnet events! 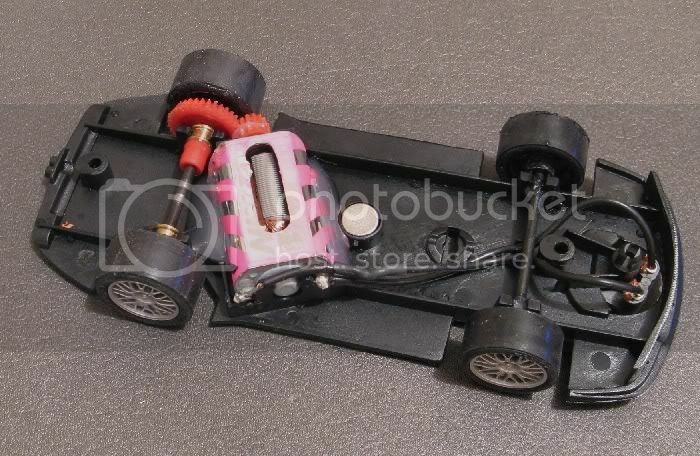 The Ninco chassis set up takes very little to get it user friendly and with an hours tinkering you will have a very easy to drive potential race winner. Ninco have made a pretty good job of this little beauty and have presented us with a complete model ready to do the deed on wood AND plastic. Some of the problems experienced with other recent models (the BMW in particular) don’t appear on this one but it does have some difficulties of its own, just to aggravate! It seems they move two steps forward and then two steps back when it comes to QA on their product. Firstly, the model’s paintwork is good. This one has a red plastic body but Ninco have gone to the lengths of painting it too! Some of their models have the natural plastic finish with a clear coat over it which makes them look decidedly toy like. Not this one! Tampo, too, is very clear and the model is well covered and presentable from that point. I had to look twice to see if the front grille was photo etched, it was looking that good. But no, just a well tampo’d rendition of the real thing. Two vulnerable points which would normally become statistics early on in the piece are the ever present door mirrors and the rear wing. The door mirrors are very sturdy and are well fixed to the door. They don’t look as if they were going to become early statistics, but this we never know until it happens. The boot spoiler too is well mounted but to be on the safe side I would find a way of getting it off or making it an easy knock out. Wheels and tyres are up to scratch as far as run out and eccentricity is concerned but on inspection in the shop, my model had two faults which didn’t impress!! The first was a split front tyre. Fortunately my local store, Red Racer, changed the front tyres for me. 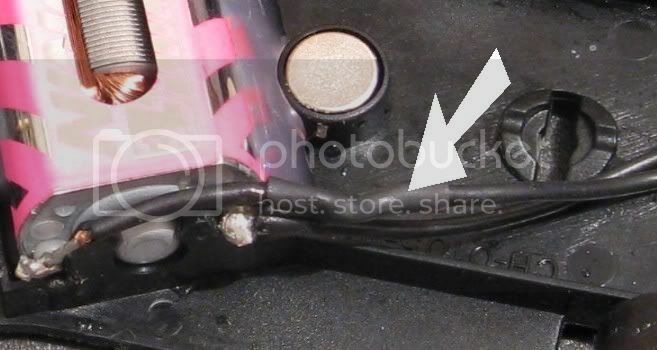 This phenomenon had been caused by severe sprue flash on both front hubs. This had been digging into the front tyres and one has eventually split as a result. On removing the top it was no surprise to find the motor was loose!! Not to worry, this was expected and the glue gun was already on to rectify this. All else looked fine and Ninco shaped, so, as this model is going into combat, I decided to do a few simple things while it was apart. As already mentioned the motor was glued in. I do this one side at a time and let each side cool a bit before doing the other side. The reason for this is that my glue gun is a reasonably hot one and if the model were left resting on its base, the glue would have flowed all over the chassis. It helps that I can tilt the chassis to let the glue set in place in a good fillet between the motor and the chassis, then I reverse the operation for the other side. Next up is to give the model and the body a little bit of play. This means that the chassis has to be able to move freely inside the body without restrictions or catching. Firstly the chassis had to be scraped all round the outside to remove the body ‘pinch’ effect. Once done it was obvious that the exhausts at the rear were not helping by fouling the body cut away. The solution here was to file out the cut away out a bit to increase the movement areas. 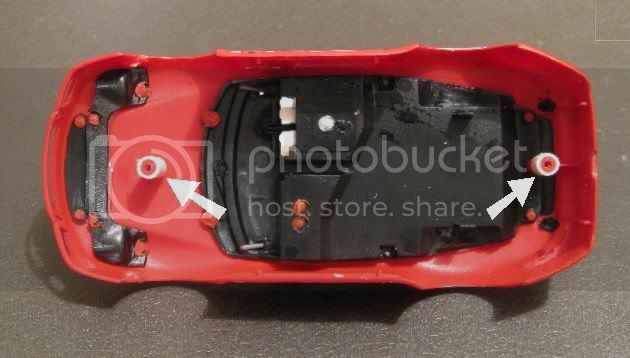 The body was still being restricted in its movement and closer inspection showed the top terminal on the motor was fouling a chassis stop on the body. Rather than cut the stop off as I wanted it to work for me, I desoldered the RF device in the power lead and carefully, using a small pair of pliers, bent the tag vertically. 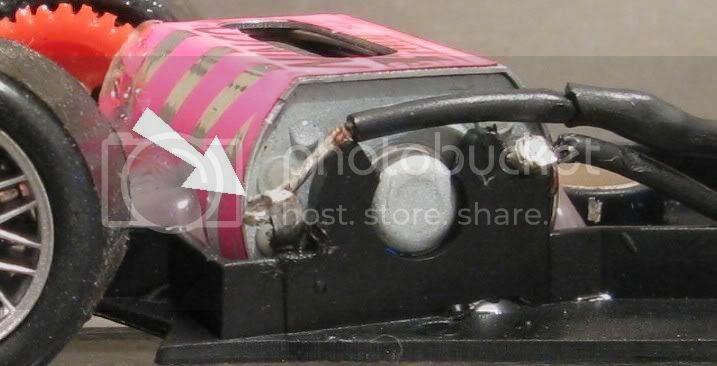 I then spliced a new piece of lead wire into the shortened lead and covered the joint with heat shrink insulation, the spare end being reattached to the motor to complete the circuit. Lastly I opened up the body screw holes with a small round file to give the screw threads a little more clearance. Also, whilst delving into its interior I decided to reinforce the body mounting posts. These have been known to crack before now and for the sake of a few minutes I could minimise the risk. This was achieved by gluing a length of plastic tube over the chassis end of the posts and trimming once set. The gear mesh was very slack and the rear axle had a lot of sideplay in it so this was reduced by sliding the pinion down the motor shaft a little and running the gears in with fine polishing compound. Just for good measure I reduced the sideplay in the front axle and cut grooves in the front tyre rubber, as well as radiusing the tread area. This model won’t be having the ‘Wixle’ conversion so I wanted to reduce front tyre drag and sideslip as much as I could. I notice this model has a couple of miniature clips moulded into the chassis behind the front axle. These are supposed to have the lead wires clipped into them although this model didn’t, as like other manufacturers, this is a good idea. It is a simple way of creating a returning guide without having to have complex spring and guide system. 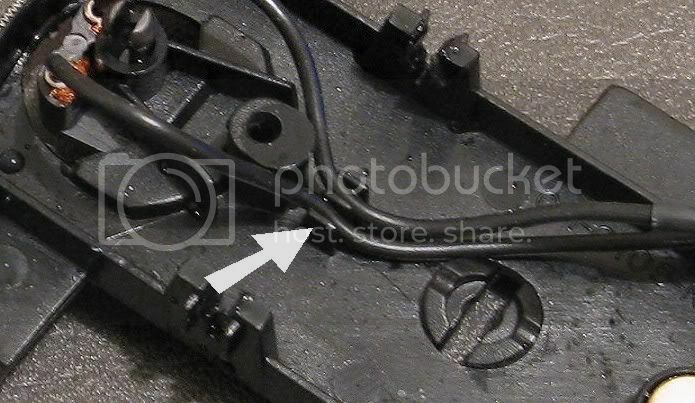 Needless to say the lead wires were installed securely back in these clips. I decided to open up the motor apertures on both sides. These are normally covered over by the foil wrapper probably to keep muck out of the motor but as this is such a rare occasion I decided to try and get some more cooling into it. These were carefully cut out with a modeller’s knife. Lastly, the model is very badly balanced, carrying nearly 65% of its weight at the rear. This is fine as far as traction goes but it will leave the model a bit unstable during the non power moments in its operation. It will be tail heavy when entering corners at speed and whilst cornering there will be insufficient weight on the guide to keep it down if the track has any variation. In this model’s case I will increase the weight under the front axle until I have achieved a 40% / 60% split, front to rear. Once together again I was quite happy with the feel of this model. I don’t have a home track so testing it was to be at the next Red Team session at my local. On the track the model is all Ninco and its performance for short to medium circuits is all there. For some time now I have been suspicious of the tyre compound of Ninco cars and this model is no exception. Straight from the box onto painted board the model hooked up and was blistering in its pace. Even with the rear tyres untrued the model had a healthy grip in the corners, No serious tail happiness and a rocket like trajectory from one bend to the next. Respectable engine braking without slewing sideways and when exiting bends it blistered its way down to the next! With its 24 gram body it is no slouch and has a relatively low C of G. Most Ninco cars perform well on wood but this one must be near top of the heap. You spend most of your time keeping up with it and unlike some other quick models, ‘S’ can types especially, it doesn’t have that lag on acceleration or braking overrun. It’s GO....ZIP!!...STOP!! I had an opportunity to run it on both Scalextric ‘Classis’ and Sport tracks. The model was typically Ninco quick but the old problems are still there. Hard pushed in a corner will see the back step out and you will be lucky to catch it. Admittedly this is being pushed hard but the point of reference would be that a similar Scalextric model will hold on in the same bend at the same speed. I don’t doubt that on Ninco track it will find that little bit of extra grip. Another perennial problem is the deeper guide. I am happy with the guide depth as most if not all the local board tracks can accommodate it but on Scalextric and SCX the guide will bang away persistently, lap after lap. If you race your model on other circuits and don’t want to trim the guide down, you have a couple of alternatives. One is a replacement guide and the other is to cut a slight slope on the front bottom edge of the guide. This won’t stop the noise but it does quieten it considerably and you don’t loose that extra precious guide depth! It would be unfair to compare it directly to Scalextric and Fly models as these have low torque motors by comparison and their sidewinder models are geared at over 3 : 1 whereas this model runs a very tractable 2.66 : 1! So, at the end of its first outing I have no qualms about this being able to do the business. 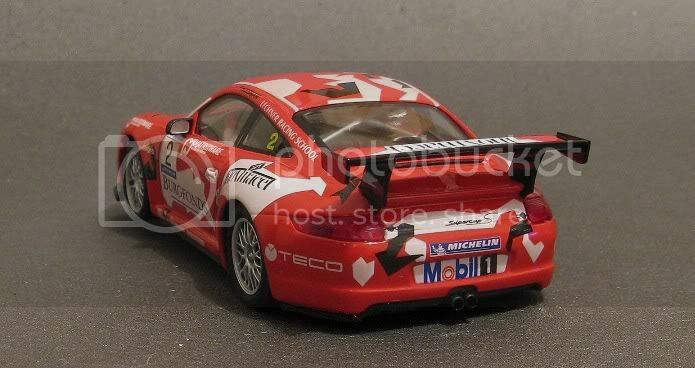 When the Porsche Cup event kicks off it will be on Ninco plastic as well as board and I expect this to do well on both. I must admit I do have a hard time coming to love Ninco cars in general. I adore their NC1 classics. They drive well and look great, so far! But in the past I have to admit to using Ninco models for competition and selling them online after their time has passed. Will this be the fate of the 997?? Who knows? Just broke the wing on my Burgfonds^&*&$%^&*(*(())(^%$! Know were I can buy one. That'll be a hard ask. I did manage to get some Ninco wing spares from the importers via Kevin at Scalex world a couple of years ago but I suspect things are harder now.